The Gifted closed out its first season tonight with a major status quo shift for mutantkind. SPOILER warning for The Gifted's Season One finale follow. In tonight's two-hour finale, Polaris blew up a plane to kill a US Senator and Dr. Roderick Campbell. She then joined the Hellfire Club. Several members of the Mutant Underground went with her, including Andy Strucker. Jace Turner quit Sentinel Services, and the Mutant Underground's hideout is now in ruins. 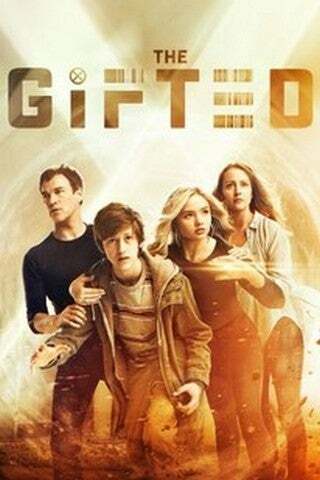 In other words, the entire world of The Gifted as we knew it when the show began turned upside down. ComicBook.com spoke to executive producer Matt Nix about the finale's big turning points and what they mean for next season. ComicBook.com: The finale is huge for Polaris. She kills several people and then joins the Hellfire Club. Is this a point of no return for her, or is there still a chance for redemption in her future? Matt Nix: Emma [Dumont] and I talked a lot about what Polaris is doing in that episode. I mean, what does all of this mean for her? And I think that the big thing is she's doing this on behalf of people she really cares about, ultimately. And that includes people in the Mutant Underground. That certainly includes Eclipse, and Thunderbird and Blink and all of these people that she's worked with, but you know, when she looks at the situation, she just comes to, whatever her misgivings about the Frosts, she comes to agree that there's a thing here that needs to be done, and her feeling is she's the only one who's really in a position to do it. Thunderbird can't do it. He feels the weight of the mantle of the X-Men too much. Eclipse can't do it. He came from circumstances where he was doing things he considered evil, and he's been running for the entire time they've been together. Blink has already flirted with that side of things and rejected it when she spent time with her Brotherhood. And so, she looks at this situation and goes, "Somebody's gotta do something, and I'm the only one with the power and the will to do it." And you know when she confronts that reality, what she finally accepts is the reality of her heritage. She's like, “Maybe this is what I was born to do, maybe this is who I've gotta be.” And, so certainly, that's what gets her over that divide, but I think it's important to remember at the end of the season: all of the people who go with the Frosts are doing this on behalf of people that they care about. Those battle lines are drawn but everybody on both sides of the battle lines cares about each other. So, I think that it's a very significant line she's crossed, but she hasn't lost sight -- nobody's lost sight of the fact that they care about each other, and on some level they share the same goals on securing a future for mutants. When I was watching that final scene, where Polaris shows up to invite other mutants into the Hellfire Club, I couldn’t help but be reminded of the end of X-Men: First Class, when Magneto shows up with his Brotherhood and invites Emma Frost to join them. Did you have a scene like that in mind when you were writing this script, is this recognition just the result of Polaris’s natural Magneto-ness coming through? I think that you can't not have moments like that in mind, although I think that, to some extent -- when I think about that, these conflicts, they're central to the X-Men. I mean, they're central to that universe. The idea of, “What action should you take in the face of oppression and discrimination and violence?” That's a constant throughout this universe. I think certainly we wanted to do our own version of that. So when I think about that, when Magneto does it, they're joining the Brotherhood. They don't call it the Brotherhood of Evil Mutants, but we all know what it is, right? And “evil” is in the name. Ultimately they're not really devoted to a functional version of society. So there are certainly echoes of that in this. But I think that the difference is -- I would say there are elements of this in both sides -- but our version of that is much more about, Polaris takes this step because she loves Eclipse and she doesn't want to put the people that she cares about [in danger] -- and in a way she loves Thunderbird, and she really cares about Blink, and she's just lost Dreamer, who was a good friend of hers. So, in the face of all that, she's doing this on behalf of the rest of them. That's certainly less of an element if you look at the X-Men versus the Brotherhood. Certainly, there is a relationship between Magneto and Charles, and that's important. But, there's not as deep a bond, except occasionally in some deep cut comic run there is, but for the most part, there's not as profound a bond between the sides. The conflict in the first season was almost entirely mutants vs. humans. With the Hellfire Club now positioned to be a player in Season Two, will we see the Mutant Underground not just trying to survive but taking on the X-Men’s usual role of protecting humans from other mutants? So, going into Season Two, you know, things will have changed, and they will change for everybody, and they're all going to have to rediscover and redefine their relationship to society. And the headquarters is gone. They talk about this a little bit, but it's not like giant ruined banks in areas that nobody goes are just sitting around. They don't get another headquarters off the shelf. They're going to have to figure out a new thing to do. But then one thing I also think a lot about in Season Two is, when you think about the movies, generally speaking, they have to define, “There’s two sides. There's this side and there's this side.” Well, we, for this first 13-episode run, we've already kind of explored the idea that they're not exactly on different sides, the beginnings of the Hellfire Club and the Mutant Underground. They're kind of working towards the same goals, and they're in a position where they kind of need to team up. I mean, there's not a lot else they could do. And then, going into take two, I like the idea of that there are all sorts of ways of dealing with this new circumstance that everybody finds themselves in, and not everybody's going to agree, and not everybody's going to choose one of the sides that we've defined on the show. Exploring those other sides too. I think it's going to be very interesting. There are going to be common enemies, people who are more aligned with one side than other. There are going to be people who are completely selfish in their motives. All of those things are going to come out in Season Two, where the situation for mutants has got considerably more complicated. I spoke to Emma Dumont earlier this season. She told me that she would really like to wear Polaris’ headdress from the comics. Does her new position as leader of the Hellfire Club, a more aggressive faction with some resources, make it more likely that she could have that wish come true? I... would just say... that's something we should wait and see on. Let me put it this way: One of my favorite things to do with this show and one of the biggest joys of the show, in general, is finding ways to bring in aspects of the comics and aspects of the characters that, if you're familiar with the comics or whatever, and find new ways to do them. When I think about costume elements for all of the characters, there are aspects of that that I would love to bring in, but we need to find our own way to do it, because this isn't a uniform show. It would make any sense for people to run around in uniforms when they're supposed to be hiding from everybody. But at the same time, if there was an opportunity to put Xs on people's chests at some point, that would be super fun. I’m servicing my inner comic book reader with this show very much. I'm trying to be true to my younger self. So, do I think that would be cool? Yes, I absolutely think that would be cool. And I think that if we're going to do something like that, we're going to find our own way to do it and not just be like, "Okay, now she wears the uniform." Like, go shopping for green clothes Polaris, because you're going to be in a lot of them. One of the characters most changed from the season premiere of the season finale was Jace Turner. You also introduced the Purifiers later in the season, a mutant hate group. I feel like episode one Jace Turner would have rejected the Purifiers out of hand. But season finale Jace Turner, is he someone that could find common ground with the Purifiers now that he’s quit Sentinel Services? If you go way back to the beginning of the X-Men comics, the idea of racial discrimination, it was very much a metaphor. There's discrimination against X-Men in this world, but it doesn't exist in a world where there's also a lot of racial discrimination explored at the same time. There's discrimination against mutants, and that sort of stands in for racial discrimination. One of the things I think that is interesting for Jace Turner is he's an African-American guy who, this is a world that exists where there was a Klan as well, where apartheid happened, and it touched on mutants, but it was not primarily associated with mutants. It was primarily a racial issue. And so, one of the things we want to explore with Jace next season is, how does he navigate those lines? I mean, ultimately, how comfortable is he going to be with making common cause with a group that, to him, they're reminiscent of the Klan. I think it's important that he's not a guy who can never make the connection between people who run around in uniforms with white crosses on their chest and his own people's history. At the same time, he's a guy who at this point really feels like he's lost a daughter to the mutants, he's lost a partner to the mutants, he's lost coworkers, he's lost a job, he's lost memories. All of these things. And so, that's the other side of it. And you know that's a sort of central theme in the show. Like, to what extent is the enemy of your enemy your friend? And, so, I think it's a great question to ask, but it's something we're going to explore in Season Two rather than touch on quickly and then move on from there. Speaking of the Purifiers, I noticed you dropped the name Madeline Risman in the finale. That may sound familiar to X-Men fans since Matthew Risman is the leader of the Purifiers in the comics. Should we expect to see the Purifiers play a larger role in Season Two? Obviously, there are a lot of conversations to be had with the networks, studios, producers and things like that, so I'm hesitant a few days from a renewal to promise specific things, but I will say we did not drop the name “Madeline Risman” into the show by accident. One of the things I can say about the Purifiers is they're just regular people a lot of them. It's a thing that can exist everywhere. It's not the Sentinel Services. It's not a place that, I mean, it might have a headquarters, but you can work at a supermarket and be a Purifier. That's a really interesting avenue, I think, to explore so that the show is not simply an endless battle between the Sentinel Services and the Underground. That's part of the reason we wanted to blow up the headquarters at the end of the season, and get Jace out of the Sentinel Services at the end of the season was to send the message. We're not just going to do the same thing over and over. It's not just going to be like, "And this year the Sentinel Services has another kind of thing. And then they're going to go after a different headquarters,” because that could get old real fast. So, what I love about the Purifiers is that they can be anybody and in a way that's a lot scarier. The Sentinel Services, as scary as they are, you know where they are and they're bound by law. They're bound by at least to some extent by laws, and the need to put people in jail and be called before congressional committees, but you know, Purifiers don't have that same thing. They're just misguided people with the sweatshirts with the crosses on them.